Are you looking for work as a private investigator? Do you want the best private investigator job for you? Maybe you've been drifting from one boring job to the other and want the ultimate career, the career that will make you want to jump out of bed in the mornings. Well, search no more! 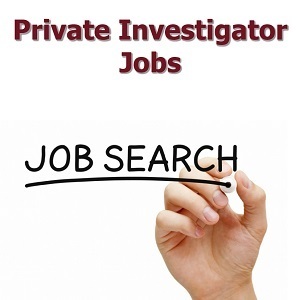 There are hundreds of private investigator employment opportunities available, providing you have what it takes to become a private investigator. 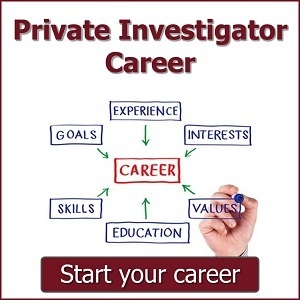 If you're already in employment and have an investigator position but feel you need a change, then read on... As a new job-seeker to the industry or as a seasoned investigator, we will go over with you the different types of jobs and careers you can move into as a successful private investigator. A private investigator is also commonly known as a private detective and the purpose of a modern private investigator is to provide high quality legitimate investigative services. Based on this purpose you can see a few key elements that need to be fulfilled as part of the job description of an investigator - HIGH QUALITY - LEGITIMATE - INVESTIGATIVE - SERVICE. High Quality - meaning of a high standard measured against similar things or actions - indicating a high degree of training, skill, and personal achievement being required as part of the job description. Legitimate - meaning legal, conforming to laws or rules - indicating that a PI job candidate needs to be highly ethical. They will do what's right for their employers or clients, in spite of being presented with easier unethical options. It also means the necessary training and licensing (if applicable) should be achieved. Investigative - meaning the systematic inquiry into something or someone - which indicates an applicant needs to be of a rational inquisitive nature. They should have a high ability to confront and to inspect and to see what is there, rather than what someone says is there. Service - meaning an activity or skill provided for another - indicating having something to offer that someone else wants or could benefit from. This would be a job skill or ability. Skills can easily be developed through job-training to allow you to offer quality of service. The following is a summary of a private detective job description you can expect as part of your duties when you apply for a job. You can learn more about what a private investigator is; the qualities, the requirements, and the skills needed for this profession in this article. The options of whether to work for yourself as a private detective, or in a well established agency, is not entirely a matter of choice for some. Unless you already possess a PI license, or work in a State or country where one is not required, you will have to start your private investigator career as a trainee with another agency. New people searching for investigator jobs, in order to qualify to the position of a licensed investigator, have the hurdle of gaining some form of private investigator work experience first. Although some agencies do take on investigator trainees it will usually be expected that you would have had some form of related work experience or training, such as in the military, law enforcement, legal training, or security work. However, not having this work experience doesn't prevent you from entering the private investigator career path. Entry level investigator jobs are not that easy to come by for those that have no related experience, or haven't even attempted to educate themselves. To get the best shot at a private investigator internship you will have to take the iniative to put yourself through some form of private investigator training school. Taking a course prescribed by your State or countries licensing laws will put you way ahead of others when applying for private investigator trainee jobs and work experience. You can find more information here on first becoming a private investigator. For those who already have a livelihood working as an investigator, the options are wide open. You have the option of working for an agency or for yourself. A detective job working in an agency is perfect when you have just gotten your license and want to continue to build on your skills, by following seasoned investigators. You also don't have to worry about finding clients, or the headache of business administration. There are many benefits of being an employee. One of the downsides to working for an agency is obviously pay. You won't earn half as much being an employed investigator. It can be said that working for yourself is both tough and very rewarding. If you are adventurous and want to build your own private investigator business, earn more money, and be your own boss, then becoming self-employed is for you. Most investigation businesses are small, usually made up of one or two investigators in partnership. If you plan on setting up on your own it's good to network with other agents you can rely upon. You will need reliable assistance from time to time. All private investigators during their career will encounter a whole spectrum of investigation work. From tracking down debtors, to number crunching a financial crime, to murder cases gone cold; the job of an investigator is sweepingly diverse. Despite the general population of investigators doing a little of everything, there is a place for different types of special investigation jobs. Some investigators prefer to specialize in one particular field and become expert in that field. A Criminal Investigator usually works for a government agency, whether locally or at a State level. These Special Agents are sworn law enforcement officers with the authority to investigate and enforce state and federal criminal laws. Special Agents conduct criminal investigations including, violent crime, drug violations, conspiracies and organized crime. A Background Investigator's function is to look into someone's past and verify identity and credentials. This type of job will usually be office-based asking questions over the phone, doing internet research. There will also be times of making door to door enquiries and searching public records in Court Houses. A Legal Investigator's occupation is primarily working with law firms, lawyers and attorneys. The purpose of the legal investigator is to work with the legal team, finding and reviewing evidence of cases objectively. The job of a legal investigator will include locating witnesses, interviews, and fact gathering tasks. A Fraud Investigators job is to uncover and investigate deceptions resulting in some form of loss to the victim. The Fraud investigator will be tasked with uncovering false representations made to deceive and may include searching through financial records, uncovering an identity thief, or corporate scam. A Criminal Defense Investigator's task is to assist the defendant in a court case who has been accused of a crime. The defense investigator will have the duties of reviewing the police reports for accuracy, and (similar to the Legal Investigator) will be required to find witnesses, gather evidence and prepare court exhibits. A Crime Scene Investigator, also known as a forensic investigator or crime scene technician, used to be the function of police officers but now civilians with a scientific background are employed. The CSI's job is to work mainly in the field gathering and documenting evidence of crime scenes. A Corporate Investigator's duty is to investigate internal matters within a company that employs them. The type of work a corporate investigator can expect to get involved in will be internal theft / fraud, employee background checks, drug taking, countering corporate espionage, counterfeiting and patent infringements. An Insurance Fraud Investigator (similar to a Fraud Investigator) will primarily work for insurance companies proving or disproving insurance claims. The work of an insurance fraud investigator ranges from investigating simple compensation claims to more complex insurance scams. Computer Forensic Investigator work delves into the inner workings of computers and networks and how they have been used in crimes. It involves retrieving and examining deleted computer data, emails, breaking encryptions and finding passwords as well as how network systems have been compromised. A forensic accounting job suits someone who is interested or good with numbers and with an accountancy background. A Financial Investigator (usually a licensed CPA) will be heavily involved with financial crime, fraud, embezzlement, money laundering, tax evasion and finding hidden assets. There are other specialised types of private investigation jobs not listed here, however, you can specialise in any area you wish to - just get expert at it! Good luck in finding you career-path, and if you get stuck search here for your ideal investigator job. If you're involved in a criminal matter find out how a private investigator can help in a criminal case. If you're ever considering having an affair, read our guest's story first!